Why the increased interest in ETFs? The primary factors may be trading flexibility and relatively low costs. An ETF is a portfolio of securities assembled by an investment company, similar to a mutual fund. Yet these two types of funds are traded very differently. Mutual funds are typically purchased from and sold back to the investment company and priced at the end of the trading day, with the price determined by the value of the underlying securities. By contrast, ETFs can be traded throughout the day on stock exchanges, like individual stocks, and the price may be higher or lower than the value of the underlying securities because of supply and demand. The trading flexibility of ETFs is part of their appeal, but it might lead some investors to trade more frequently than may be appropriate for their situations. And while you can usually trade between two mutual funds in the same fund family directly at the end of the trading day, if you want to move assets between two ETFs (without using additional funds), you have to sell the first ETF and then purchase the new ETF. ETFs typically have lower expense ratios than mutual funds, but you must pay a brokerage commission whenever you buy or sell ETFs, so your overall costs could be higher, especially if you trade frequently. Most ETFs are passively managed and track an index of securities, which helps keep fees low. However, a growing number of actively managed ETFs assemble a specific mix of investments reflecting the fund’s objectives. They may have higher fees than passively managed funds. 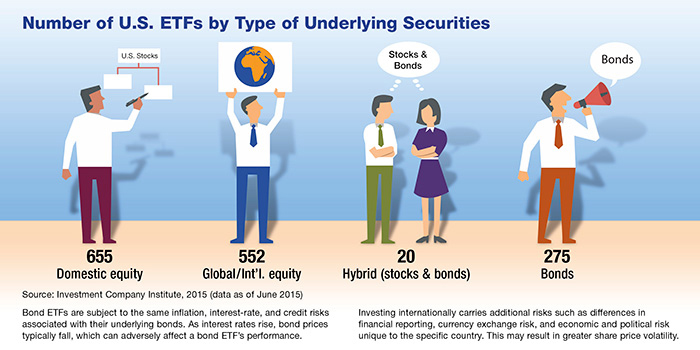 Because ETFs are available across a broad range of indexes, they can help provide cost-efficient diversification. As with any investment, consider the potential risks before making a decision to include ETFs in your portfolio. Diversification is a method used to help manage investment risk; it does not guarantee a profit or protect against investment loss. The principal value of mutual funds and ETFs fluctuates with market conditions. Shares, when sold, may be worth more or less than their original cost. The information in this article is not intended as tax or legal advice, and it may not be relied on for the purpose of avoiding any federal tax penalties. You are encouraged to seek tax or legal advice from an independent professional advisor. The content is derived from sources believed to be accurate. Neither the information presented nor any opinion expressed constitutes a solicitation for the purchase or sale of any security. This material was written and prepared by Emerald. Copyright 2016 Emerald Connect, LLC.